Brand new in 2016 our Tuscany Planters are traditional & lovely. With its square design and detailed rolled opening & sides this planter is deep enough to hold most plant materials like flowers, succulents & cactus, evergreen bushes and shooting palms. Group them together to create a unique & interesting display. 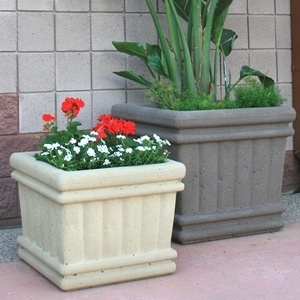 Our concrete garden pottery is manufactured in Arizona using a high-quality concrete mix and mold process. This secret concrete mix includes a volcanic rock harvested in Sedona, Arizona. 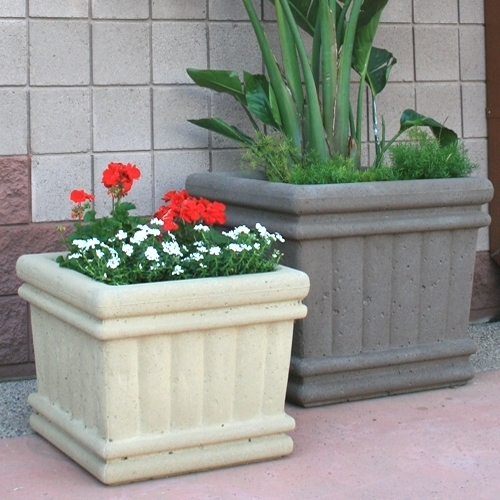 Compact, durable and available in 15 color choices make these planters the perfect containers for any Home & Garden project. Each mix is colored before pouring so any future chips will be hardly noticeable. Choose your color, your finish & your drain hole preference and we will have your planters manufactured just for you!